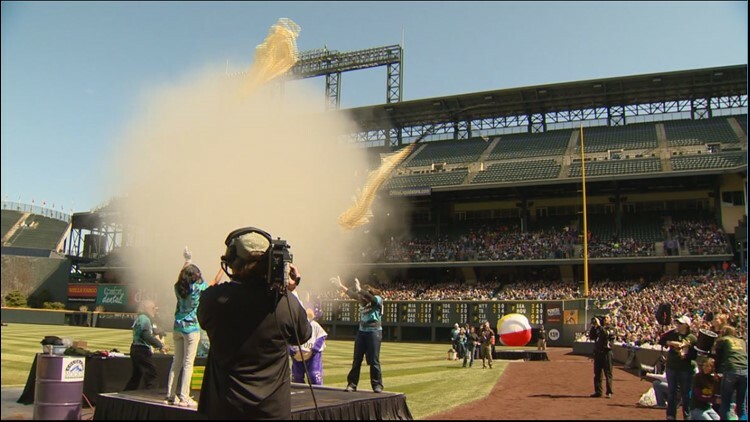 The Colorado Rockies, Steve Spangler Science, 9NEWS and Colorado State University teamed up to launch the 10th Annual Weather and Science Day at Coors Field. The Colorado Rockies will host the 10th annual Weather & Science Day Wednesday with an estimated 15,000 students, parents and teachers learning more about STEM careers. Steve Spangler is the ringmaster and he’s joined today by the Denver Fire Department to give us a preview of what’s going to happen on Wednesday. Steve Spangler is throwing out his first Rockies pitch. Have a soda that's been shaken up? Steve Spangler shows us how we can keep it from bubbling over when you open it up. There are some strange sounds coming from inside our studio and we think they're coming from our science guy Steve Spangler. Science guy Steve Spangler shows us how to have fun with weird types of paper that react in incredible ways. Our science guy Steve Spangler continues his series of simple and easy do-it-yourself projects that combine some clever science with a twist of mind-bending magic. High-frequency electricity can travel through your body. Steve Spangler demonstrates how it's done. From sand and gravel to rock salt and magnesium chloride, the people who maintain our roads are constantly searching for the most most innovative ways to keep our road clear of snow and ice. Our science guy Steve Spangler looks at the science of de-icing with a cool experiment you can try at home. Should you fill your tires when that low-pressure light comes on? Maybe not, Steve Spangler uses balloons to demonstrate the science of tire pressure. We usually think of using water to extinguish a fire. But our science guy Steve Spangler shows us some of the hidden science behind steam.